There are thousands of events at the annual cultural extravaganza in Scotland’s capital, many of them involving alcohol in its various forms. The whisky line-up may be somewhat brief, but does quality make up for lack of quantity? Tom Bruce-Gardyne casts his verdict. There are a mind-boggling 3,548 shows at this year’s Edinburgh Fringe (3-27 August), and it’s not hard to imagine that alcohol plays a role in many of them, with names like ‘Wishful drinking’, ‘Addicted to fun’, ‘Gin safari’ and even ‘How to drink wine like a wanker’. But when it comes to shows that directly involve whisky, the list thins out somewhat, thanks in part to fierce competition from that super-cool beverage of the moment, gin. Author Charlie MacLean had a one-off whisky masterclass last Saturday, and today (9 August) sees writers Blair Bowman and Nikki Welch take their Whisky Tube Map show to North Berwick. Nonetheless, there a few whisky events taking place in Scotland’s capital throughout August – so here’s our pick from this year’s Fringe. It is 1pm, the sun is nowhere near the yard arm and it feels a bit early for anything stronger than ‘a soft drink’, as one famous whisky writer calls wine. But such reservations disappear deep in the basement of Robert Graham’s shop on the Canongate – the slightly less frantic end of the Royal Mile. It is a candle-lit twilight zone where whisky feels right just about any time. Store manager Keith Aherne introduces us to Finn Cowe from Wemyss Malts for a tasting of three of the firm’s blended malts. Softly-spoken Finn proves to be an excellent guide as he encourages us to sniff deeply using both nostrils as, apparently, the sensitivity of our schnoz flips between the left and right side during the day. And he avoids the mistake made by so many in the trade of telling us what we’re smelling and tasting before we’ve had a chance to make up our own minds. We start with the sweet, aptly-named The Hive and a spoonful of vanilla crème brûlée, which everyone agrees is a good marriage. Next, we try Spice King, which overpowers a tiny quail’s egg with dipping salts, followed by the best match of all – a profiterole full of Arbroath smokie pâté with sufficient smokiness to withstand the phenolic power of the Peat Chimney. If you can face plunging through the forest of selfie-sticks to the summit of the Royal Mile, Carina Contini’s Cannonball restaurant and bar promises some respite with this show in celebration of Scotland’s slowest stills. But this does rather beg the question why Gordon Dallas – ex-BBC broadcaster, occasional panto star and now brand heritage assistant at Glengoyne – appears somewhat rushed in his delivery. As he gallops us through some whisky history and a tasting of three Glengoyne malts, he needs to slow down to the pace of the stills – just five litres a minute, in case you’re interested. Aside from that, it’s all good fun, with Dallas playing the part of Cochran Cartwright, the first distillery manager, amid some impressive audio-visual razzmatazz. There are raindrops streaming down in front of us and greedy angels swirling on the ceiling above. We hear how the restaurant got its name as our host slips away briefly with the words: ‘If these walls could talk.’ And they soon do, with cartoon animations of past owners like Hugh Laing telling us Glengoyne’s story as we sip drams of the 10- and 18-year-old. The first paired well with a tasty deep-fried black pudding bon-bon, the latter rather swamping some Clava brie on an oatcake. Then comes Glengoyne Cask Strength with a chocolate truffle and an invitation to mix the whisky with some marmalade bitters. According to Dallas, even to suggest such a cocktail would have once condemned us to the fiery pit of hell. In terms of food, the Cannonball gig and the fare on offer at Robert Graham’s certainly won’t fill you up. 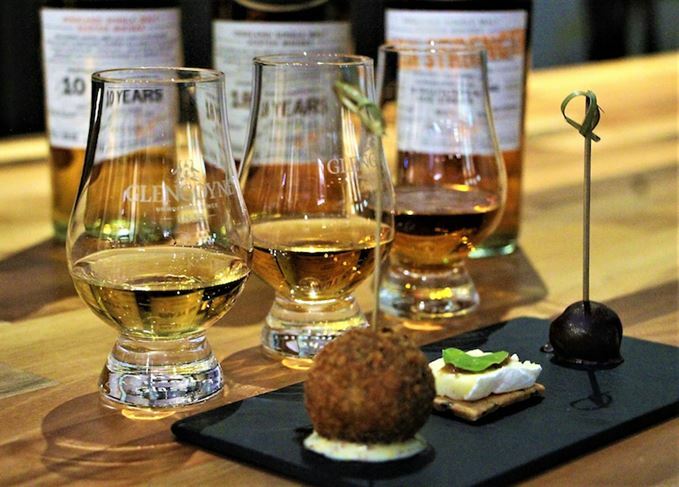 So, if you fancy a proper three-course lunch or dinner rolled into a Fringe whisky show, head for the Scotch Malt Whisky Society on Queen Street. It all starts gently enough, with guests getting to know one another over a 30-year-old grain whisky but, after this sublime aperitif, in bursts a black-kilted Highlander to shatter the peace. It’s the actor Jock Ferguson, who has come not from the Highlands, but from ‘Fife on my free, over-60 bus pass’, as he tells us. We’re soon enthralled as he regales us with poems by William McGonagall and tales of his bit-part role in Outlander, but his character is almost too big for the room. There’s a frisson of fear as he prowls about us, presumably looking for a victim. Sure enough, for the crime of videoing our host without permission, Bill from Kentucky is hauled up to recite Robert Burns’ Address to a Haggis in his best Scots brogue. It has the rest of us in stitches as poor Bill turns puce from the effort of trying to sound like Scotty in Star Trek. More SMWS whiskies follow, including the peated ‘Bacon Butty’, the name of which is dismissed with scorn by Jock, and the Sherried ‘Juicy Figs and Percy Pigs’ that we find delicious poured over cranachan. ‘Make sure we’re fully lubricated!’ shouts Ben McFarland at the punter that he and his co-star Tom Sandham have dragged up on stage. The two pose in their knickers as Greek athletes while their hapless accomplice oils their limbs with baby oil. The Thinking Drinkers are back for their seventh show in a row, this time on a mission to save the great British pub. From the drinking symposia of ancient Greece, we travel to a gin palace and a Wild West saloon armed with a can of American-style IPA and a steady stream of spirits. Since their Fringe debut in a Portakabin in 2011, the pair have stuck to their winning formula of handing out free drinks. This time the spirits include Ketel One vodka, some tasty Four Pillars Australian gin and the sumptuously rich Diplomatico Reserva rum from Venezuela. Sadly, when it comes to whisky, it’s just a shot of Jameson and not the Talisker 10 of last year, but we’re here for the witty repartee, not the booze, of course. Tom and Ben riff off each other’s good jokes, silly jokes and terrible puns in this pacey, well-choreographed show. It ends with the rousing ‘See you in the boozer’ sing-along and a plea to sign the Long Live the Local petition and help rescue the pub from extinction. The coveted gig is a haven for whisky fans in the midst of the capital’s chaotic festival season. A walking tour through the historic, whisky-laden streets of the Scottish capital. Amid the cabaret and comedy, there’s still room for Scotch at the world-famous arts festival. The city is to welcome a state-of-the-art whisky experience as part of a £150m investment. Work to build Edinburgh’s first malt distillery for nearly 100 years will begin next month.